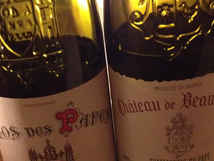 Two very special wines ! Last weekend I had the pleasure of staging three tastings for some MW (Master of Wine) students, both those about to take the exam this year and some who have just started the course. As a break from tasting and studying, on the Saturday evening we found a restaurant that would allow us to take our own wines along – the Union Brasserie – something of a Niçois institution which features generous and well priced local dishes in a convivial if not-hugely-sophisticated setting. As an aside, if you decide to do likewise then take some good glasses too! However, brasserie glasses notwithstanding, I was driving so could only taste some very wonderful wines rather superficially. 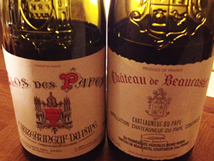 However, two were the most wonderful Châteauneuf-du-Pape bought along by the lovely Isabelle Ogier, and these bottles made it back to the hotel the following day and then, because everyone else was flying home, chez moi. Quelle chance! 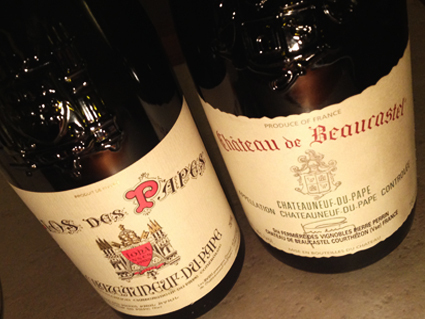 Châteauneuf-du-Pape is a sturdy wine capable of lasting – even improving even – for several days after opening, as it proved. Made from a mixture of grape varieties, of which the most significant is Grenache, blended with Syrah, Mourvèdre and a whole pile of (up to eleven) others. These are two of the best. This is a monster wine, with plenty of alcohol, richness and extract from the plush fruit. A blend of 65% Grenache, 20% Mourvedre, 20% Syrah, with the balance made up of Vaccarese, Counoise, and Muscardin. It was/is very young, but has the depth of peppery red fruit Grenache, and the abundant liquorice and spicy, meaty notes of Mourvèdre and Syrah, with a complexity of spices and almost garrigue-like heathery broom hints coupled with a little thyme and violet. 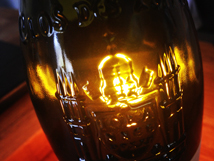 Sensationally complex, and a wine either to age or enjoy over the course of two or three days. I have had an on/off relationship with Beaucastel for many years, since first starting at Oddbins in London in the 1980s, where it was one of the most aspirational of wines of all for us. 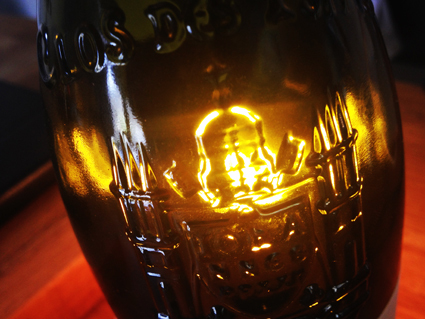 The Coudoulet de Beaucastel Blanc was one of the first white Rhône wines I tried and really helped ease me into this whole wine thing in the first place – I can still recall its heady fragrance of honey, flowers and almond blossom. 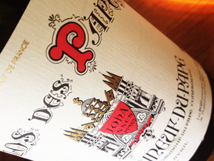 Beaucastel is run by the Perrin family – who put on the most spectacular and informative tastings, the wines come from traditional cellars, and the Châteauneuf itself is a blend of all thirteen permitted varieties, with a large percentage of Mourvèdre (30%). This grape has always displayed the earthy, almost animally side of the region, and is also – apparently – the grape most likely to allow for flavours of Brettanomyces. This is a yeast which in small doses imparts a complex, savoury, meaty (think smoky bacon crisps) edge which can really work, but in high doses, for me anyway, seems to scalp out the freshness of the fruit and overlay lay it with a, frankly, horse-sweat flavour which is just unpleasant. Some people regard any ”brett” as a fault. Others, me included, tolerate and enjoy a little, while a few appear to revel in the flavour (or perhaps they are just not as sensitive to it). Anyway, throughout the 1990s and 2000s, a lot of people, again including me, found just too much of this character in Beaucastel for the (red) wines to be pleasant to enjoy. But, deliciously, it seems as though something has changed. (I may be late to this party I have to admit). The 2006 is wonderfully harmonious. 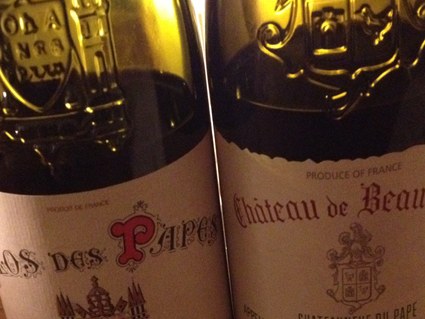 The sweet, smoky savoury flavour is still there, but it is surrounded by lots of ripe delicious fruitiness, and this wine has achieved a layer of complexity that even the Clos des Papes might envy. I doubt that I shall ever be a fan of the top wine from this property Hommage à Jacques Perrin because it seems to have just too much of everything (including residual sugar, oak and alcohol) for my taste, but I am delighted that this Châteauneuf cuvee is now firmly back on my aspiration list. Shame that it’s so expensive really!